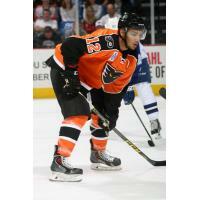 Lehigh Valley, PA - The Philadelphia Flyers, parent club of the Lehigh Valley Phantoms, have returned on loan forward Tyrell Goulbourne . A 24-year-old winger from Edmonton, Goulbourne is in his third professional season and has split time this year between the Flyers (9 games, 0 points) and Phantoms (34 games, 6 goals, 4 assists) . He was recalled by Philadelphia on January 4 and made his NHL debut two nights later as part of a 6-3 win over the St. Louis Blues. A third-round selection (#72 overall) by the Flyers in the 2013 NHL Entry Draft, Goulbourne has compiled 14 goals, 14 assists, 28 points and 137 penalty minutes across 131 career AHL outings with the Phantoms. Winners of five of their last seven games (5-1-1), the red-hot Phantoms return from the AHL's All-Star Break tonight when they welcome the Charlotte Checkers, AHL affiliate of the Carolina Hurricanes, to PPL Center for a 7:05 p.m. clash . A limited number of tickets remain for tonight's game and are available HERE. And for the latest Phantoms news, visit www.phantomshockey.com or follow the team on Facebook ( www.facebook.com/lehighvalleyphantoms), Twitter ( @lvphantoms) and Instagram ( @lehighvalleyphantoms).